Improve your clothing collection by adding this pair of salwar pants brought to you by Biba. It features a solid pattern that renders it classy. Besides, it has been made of fine quality cotton, which will provide a soft touch against your skin and also ensure easy maintenance. 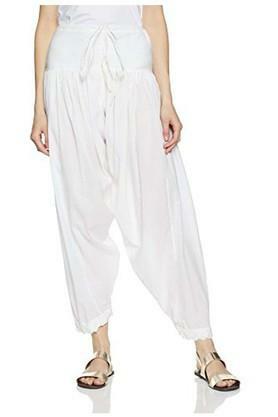 An ideal pick for casual occasions, this pair of salwar pants is made of supreme quality cotton. You can team it with an equally trendy kurta to look like a diva. The Word BIBA in Punjabi is an endearment for a young and pretty girl implying sublime qualities, so it was the name decided by Meena Bindra, the founder of BIBA for her line of Salwar, Kameez and Dupattas started in 1986. It was a line which was fashionable and affordable, which is what BIBA stands for, Fashion at affordable prices.